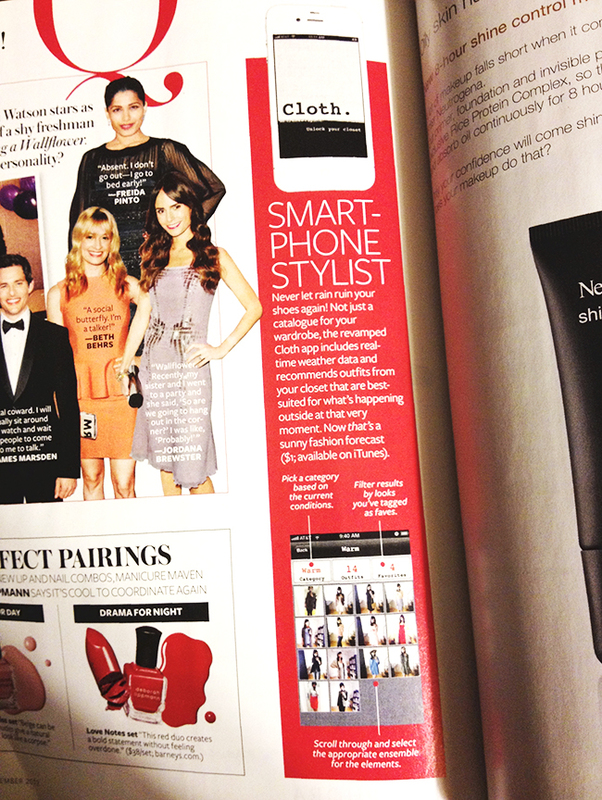 I recently found out about the Cloth app in September’s InStyle magazine. It’s essentially a ‘smart-phone stylist’, an app that catalog’s your favorite outfits and gives you recommendations on what to wear based on what the weather is outside (it has a real-time weather report system built in too). Sounds interesting and possibly helpful if I’m in a rush to get dressed and can’t think of what to wear. I’ve just downloaded it so I’m still yet to give it a go. FYI when I downloaded it this morning it said that it’s only free for a limited time (InStyle reported it costs $1). If you’re even a little bit curious about this app I suggest downloading it sooner then later. You can always delete it afterwards if it doesn’t work out for you! The Cloth app is available on iTunes or your app center on an iPhone.